Deccan Rummy is a fabulous online rummy site that does it big while keeping things nice and simple at the same time. We have a great selection of rummy games that are very intriguing and pulsating at the same time. Be it vibrant tables that are available for a diverse range of stakes or ever-growing list of promotions, No matter what you’re looking for from an online rummy site, you’re sure to find it at Deccan Rummy and you may just find something new you like too. 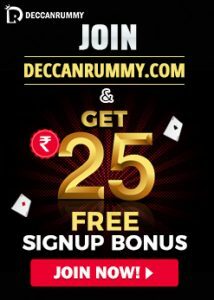 People get to know that they are at a good online rummy site only when they have some great rummy promotions and bonuses on offer and that’s certainly the case at Deccan Rummy. Of late there have been flurries of promotions and offers launched at Deccan Rummy which is enthralling as well as rewarding at the same time. It’s time for us to introduce our brand new Avatar “Rummy Raani” that is going to amaze you. “Rummy Raani” is going to be the face of the company henceforth and she’s going to cast a spell with some magical online rummy promotions and offers. Just like how superheroes come with a bang. RummyRaani has made a stunning debut bringing a carnival for the benefit of our users. Rummy Raani – out there with a bang! Called as the Deccan Carnival, this is an attempt by RummyRaani to create a virtual carnival that every user of Deccan Rummy can partake in. Are you curious to know what the carnival all about is? Are you keen to know what is the first promotion that Rummy Raani is going to give to you through this Deccan Carnival? Here it goes: we know India is a land of diversity. There are so many divisors – language, culture, race, religion, geography, and a lot of other factors. Yet what makes our country fascinating is the concept “Unity in Diversity” – there is oneness in the varieties, there is a constant emphasis on unity despite the existence of many barriers in the form of cultural, social strata, linguistic, religious, and economic factors. Our Rummy Raani is just going to tighten the knot by celebrating the diversity of India. In her quest to celebrate diversity, Rummy Raani is going to celebrate an Indian city every week by taking you on a virtual tour by highlighting the specialties in that town for you. So prepare yourself for an exemplary virtual carnival. 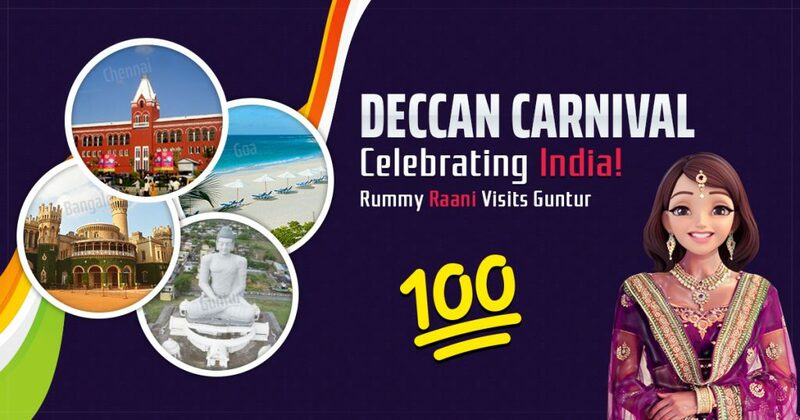 Through Rummy Raani you are going to get to know about various things ranging across from the city’s monument, culture, history, specialties, uniqueness, achievements and even famous personalities who hailed from there. Additionally, Rummy Raani would bring you stellar rummy offers. 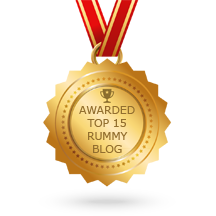 If you are a fan of rummy bonus offers, you can count on her to come up with a super awesome bonus offer. If you are a fan of rummy tournaments, you can bank on her to come up with specially designed tournament that in sync with the town that she’s celebrating that week. Likewise, she has so many different plans to enthrall all the rummy players. Just hop on to her vehicle and bank on her to do the best. We guarantee that it will be an enriching experience. Deccan Carnival – The Offer! Deccan Carnival is here to stay and we are very particular that each and every player should benefit out of it. To help get your adventure off to a great start, every week there would be a special offer every week. All the players need to do is to lap it up in its entirety. Now that you have an idea about what Rummy Raani is all about, the next question that would pop in your mind what is going to be her first stop? Rummy Raani is #Going2Guntur and will soon rock the place. • It is an educational hub of Andhra Pradesh where many eminent personalities have their roots. This region also is identified to be the major transportation and textile hub in India. • The culture of Guntur is very rich and lively and its’ residents take a special interest in art forms like Kuchipudi, Carnatic music and folk dance. International Kalachakra Festival held recently is one such example. • Guntur district is the largest producer of Mirchi and Cotton. You can find the largest Mirchi yard here. Her #Going2Guntur is Amazing right? She’s collected so many information some of which we have replicated in the tables. She’s also given the players to make some real money online with a couple of interesting offers. 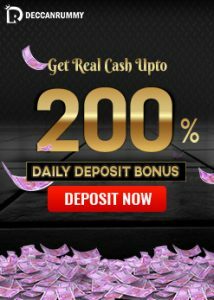 Make a deposit with the bonus code RUMMYGUNTUR and get the bonus amount credited instantly. Do not miss this awesome rummy bonus. If you’re from Guntur, you surely cannot miss this #Going2Guntur offer, Combining these sorts of benefits can really set you on your way to some big earnings. Do partake in this awesome promotion and start this month off with some extra cash!